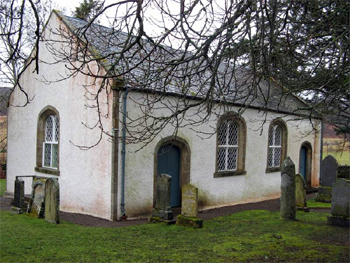 The population of Croick parish when the Church was built, was made up, as in many other parts of the Highlands, of small tenants who practised subsistence farming on patches of arable land in the straths and from shielings on the hill grazings. By the end of the 18th century commercial sheep farming was being introduced into the Highlands in general, and into Ross-shire in particular by Sir John Lockhart Ross of Balnagown. As it became progressively adopted by the landlords it brought with it a complete change in the lives of the tenants. The changes, known as The Clearances, did not reach Croick Parish until 1842 when James Gillanders, factor to the Robertsons of Kindeace, attempted to evict the tenants of their Glencalvie property in order to make way for sheep. His efforts were at first strongly and successfully opposed but he eventually succeeded on 24th May 1845 when 18 families - some 90 people - were cleared from their homes in Glencalvie in which they had lived for generations. Prior to their departure many took shelter in impoverished booths erected in the Croick churchyard and their wretched plight is recorded in messages scratched on the outside of the east window of the Church (some of which may have been added later). It so happened that a correspondent from the Times newspaper witnessed these sad events and a facsimile of his graphic despatch to his editor in London reporting them has been placed within the Church. A reproduction of the scribbled message can be seen. A further clearance, from Greenyards in Strathcarron in March 1854 which came to be known as The Massacre of the Ross’s, is also recorded in a message on the window. Following the end of the Napoleonic Wars the Westminster Parliament as a ‘thank offering’ for victory, voted funds for the building of forty-three churches and manses (to become known as '‘Parliamentary Churches'’) in those remote parts of the Highlands where the local landlords were prepared to provide the sites. The designs chosen were those of the famous engineer Thomas Telford, the builder of the Caledonian Canal. The Government also agreed to provide stipends of £120 a year for the ministers of the new parishes. Croick, which lies some 10 miles west of Ardgay in Strathcarron, was offered by the Ross’s of Balnagown as a site for one of those churches, possibly because it was already a well established preaching station. A Pictish broch was incorporated within the boundaries of the glebe. The building of the church was completed in 1827 at a cost of £1,426 and its first minister, Robert Williamson, was inducted in September 1828. He remained until 1840 when he emigrated to Nova Scotia taking some of his congregation with him. At first the Church served a community of over 200 souls. However upon the Disruption of the Church of Scotland in 1843 most of the parishioners followed their then minister, Gustavus Aird, into the Free Church. Membership of the Croick Established Church was thereby reduced to two families but it remained in being as a separate charge until 1946. It was then united with the parish of Kincardine (Ardgay) as it so remains today. Dornoch suffered less than other parts of the county from the demographic changes that took place during the first half of the 19th century. In what became known as the Sutherland Clearances, 8,000 people were forcibly moved from their crofts to make way for large scale wool production. Remarkably only a handful of evictions took place in Dornoch parish and, overall, the area gained more people than it lost. Embo was one of several coastal settlements which took in cleared families during the Clearances. In an attempt to encourage the new landless crofters to take up fishing, the Marquis of Stafford (later the 1st Duke of Sutherland) built harbours along the eastern coast of the county. Other families settled wherever they could. A few found their way to waste ground outside Dornoch and built rudimentary shelters, later replacing them with stone cottages. Yet even here they could not escape their former landlord; in 1820 they were visited by the Duke of Sutherland’s factor – and were soon paying rent to the Duke once more! Badbea is a former clearance village perched on the steep slopes above the cliff tops of Berriedale on the east coast of Caithness, Scotland. Situated around 5 miles (8 km) north of Helmsdale, the village was settled in the 18th and 19th centuries by families evicted from their homes when the straths of Langwell, Ousdale and Berriedale were cleared for the establishment of sheep farms. The last resident left the village in 1911, and in that year David Sutherland, the son of a former inhabitant who had emigrated to New Zealand in 1838, Alexander Robert Sutherland, erected a monument, built from the stones of John Sutherland's home, in memory of his father and the people of Badbea. Today, the ruins of the village are preserved as a tourist attraction and memorial to the Highland Clearances. Badbea is accessed by a footpath from a lay-by on the A9 road near Ousdale. 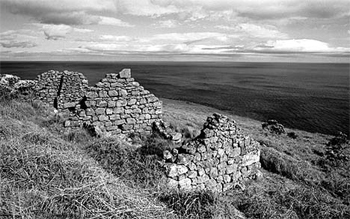 The dwellings have all fallen into ruin, and little remains other, than a few drystone walls, although the outlines of the buildings and the remains of the crop fields are still visible. There is signage by the lay-by and around the village, which gives visitors an insight into the lives of the former inhabitants and the history of the site. Toward the end of the 18th century tenant farmers were evicted from their homes across the Scottish highlands to make way for sheep farming. From 1792 onwards, displaced families began to arrive in Badbea, a small area of rough, steeply sloping land, squeezed between the high drystone wall of the sheep enclosures and the precipitous cliffs of Berriedale above the North Sea. Many of the families were from nearby Ousdale, where landowner Sir John Sinclair of Ulbster had evicted them from their crofts in order to introduce sheep. Others came from the villages of Auchencraig, on the Langwell Estate and Kildonan. When the families arrived they were given small plots to farm, but had to clear the land, hack out the plots from the steep slopes, and build their own houses from the stones they found. In 1814 the estate was sold to James Home, by which time there were 80 inhabitants. During the late 19th century the main employment of herring fishing was discontinued by the then Laird, Donald Home, in favour of salmon fishing and the population declined as the families moved away to seek a better life. The plots of land, or crofts, had room for a longhouse with a byre at one end, outbuildings, and a kitchen garden or kailyard. The rest of the available land could only support some small vegetable plots and a few cows, pigs and chickens for each family; fresh water came from a nearby spring. There was only one horse in the village and no plough, so a chaib (a kind of spade) was used to plough the soil and the harrow was pulled by a man. Each house had its own spinning wheel, and all the women learned to spin and card. The men mainly worked as herring fishermen from nearby Berriedale and the women gutted the fish that were caught. While the women worked, their livestock, and even their children, were tethered to rocks or posts to prevent them from being blown over the cliffs or into the sea by the fierce winds. At the height of the herring industry there was plenty of food, even for the widowed families, but fishing was a dangerous occupation, especially for men who were used to working on the land. The leader, preacher and doctor was John Sutherland (1789-1864), who was said to own the only watch in the village Sutherland was born at Ousdale to a tenant farmer before the clearances and had one brother, who died at Waterloo, and some sisters. His father died at an early age, Sutherland was left to raise his sisters on his own and, because of his family responsibilities, he never married. As the nearest church was some miles away, Sutherland, who was a pious man, opened his house to others on the Sabbath and preached to anyone who came. Sutherland, who was a gifted speaker, corresponded by letter with many members of the Church and became well known as the preacher "John Badbea", one of the most notable of the spiritual elite of the Caithness Church of Scotland who were known as "The Men" of Caithness. He was said to have performed many public duties for the church and made many friends across Caithness and Sutherland. In June 1885, at the age of 66, he wrote to an admirer in Glasgow who occasionally sent him monetary gifts, saying: "...I long to hear of my friend’s widow, Mrs G. Keith. Did she arrive safe in New Zealand with her dear little ones? This is a weary and dreary wilderness. 'The mirth of the land is gone'. Everything is out of order..." Sutherland died at the age of 75 and was buried at Berriedale at a funeral attended by several hundred mourners, many of whom had travelled long distances to pay their last respects. Two tributaries of the river experienced a gold rush in 1869. The history of Kildonan's gold started in 1818, when a single nugget of gold was found near the Suisgill and Kildonan burns. Scotland ensured its place in the history books late in 1868, when a brief announcement in a local newspaper stated that gold had been discovered at Kildonan in the county of Sutherland. The credit for the discovery goes to Robert Nelson Gilchrist, a native of Kildonan, who had spent 17 years in the goldfields of Australia. On his return home, he was given the permission by the Duke of Sutherland to pan the gravels of the Helmsdale River and he prospected all the burns and tributaries.